Arne Schmitt is searching for the concretized effects of political agendas. His method is comparable to promenadology, which was devised by Lucius Burckardt in the 1980s. Concisely, he paces his surroundings and photographically documents those places where symptomatic interests of urban planning and private business have manifested themselves in a striking manner – some persistent, some ephemeral or scandalous. He registers, selects and re-assembles. The atmosphere of post-war reconstruction in West Germany and the triumph of neoliberalism mark the outer points of reference of this endeavor which comprises not only the actual subject but repeatedly recalls historical aesthetics of knowledge transfer. 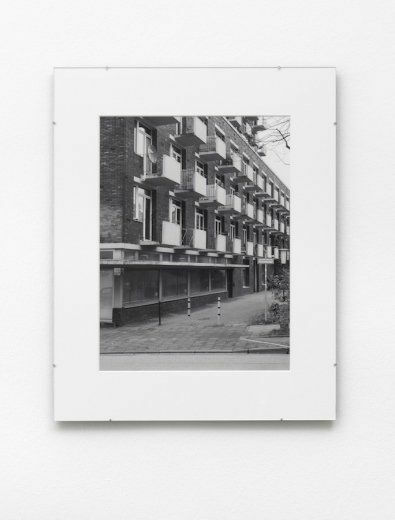 This becomes apparent in his book publications especially, for example when Schmitt treats image and text as two equal and parallel layers and blends them into essays, as committed photo books dealing with architecture did in the 1960s. This is also illustrated in his concept of making exhibitions: “One among Many” demonstrates this idea of image and text being equivalent components of his work, through the alternation on the wall in both form and content. Rhythmically, like the treatise of a failed future project, the installation combines photographs of Ernst Neufert’s Ledigenheim in Darmstadt – a residential building complex which was built for unmarried men after World War II and following its complete development has become a sought-after address in the city today – with historical and current references to the tense relationship between community, individualization and architecture. A monument to loneliness – this is how architectural critic Ulrich Conrads defined the character of Ernst Neufert’s home for single men in an article from 1960, trying to evaluate the process of reconstruction in the city of Darmstadt. It was one of five buildings, which had been designed in 1951, commissioned on occasion of the second “Darmstädter Gespräch” [conversation of Darmstadt]. It was built in the mid 1950s, decisively altered though: Neufert’s original design had been an open, light building consisting of three combined blocks. He said that in the process of designing, he always thought of it as an urban holiday resort; every association of barracks should be avoided. However, this intention became impossible to uphold once the number of required rooms had doubled at the beginning of the building process: thus, it ended up with one more storey, a fourth block which created a narrow inner courtyard, and long somber corridors leading to the apartments. Soon after completion, the shared dining room was substituted by a restaurant which left the male tenants with their tiny kitchenettes; the building became infamous, people named it “prole castle”. At the beginning of the 21st century, it was fundamentally renovated: only a small percentage of the dwellings were preserved and put under monumental protection. The others were merged into lavish apartments, most of them owner-occupied: some as maisonettes, some including an atrium on the top floor; the doorbell panel now holds several names with academic degrees. Most previous tenants have not taken the offer of an apartment at a special price after renovation; they have left the building.